Family of Geese during Spring weather in Midwest USA. Spring is always a wonderful time to transplant flowers, bulbs and assorted perennials into flower pots, planting baskets and gardens. They come in all colors. These perennial bulbs can be found in local stores like Menards, Home Depot and local grocery stores as such. These spring flowers retain soft perfume scents which attracts all sorts of animals found in these neighborhood areas. These are the best days for animal lovers to capture a glimpse of these animals and their offspring’s, how they mesh in gardens and just the look of their appearance in spring-like weather. The weather is excellent with ampule of rainfall perfect for the planting season. The early morning dew and fog keeps the temperature calm throughout the day. 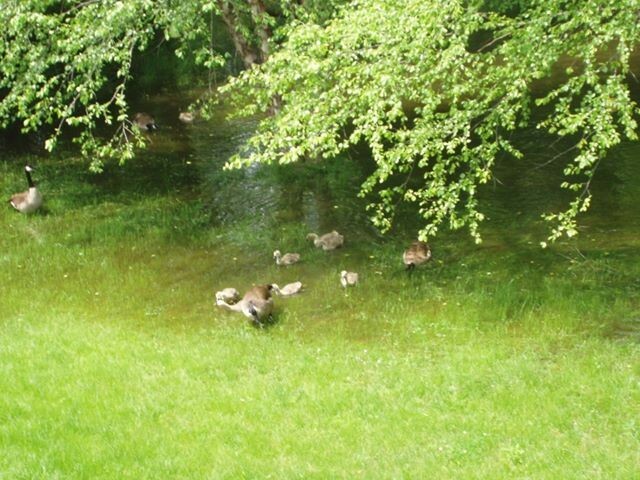 What a sight to see the ducklings dapping, sending ripples of water waves and nibbling fresh weeds chasing after their folks.